Mice with deletion of the gene for Vasoactive Intestinal Peptide (VIP) exhibit pulmonary arterial hypertension (PAH) with pulmonary vascular remodeling and RV hypertrophy in the absence of hypoxemia1. We hypothesized that these mice would also develop a decreased functional capacity of th right ventricle. We tested this hypothesis using MR microscopy to evaluate right and left heart ventricular volumes and corresponding ejection fractions in VIP-deficient and wildtype (WT) control mice. A total of twelve male mice (10–12 months) were used for the studies; Group 1 = Control; C57BL6/J male mice (n = 6) and Group 2 = VIP-/- male mice (n = 6). All animals were anesthetized and breathing spontaneously during the study. The electrocardiogram (ECG), respiratory rate, heart rate and body temperature were continuously monitored (SA Instruments). MR images were acquired on a 9.4 T horizontal bore Bruker magnet. Short axis bright blood views of the heart were obtained with an ECG gated multi-slice 2D-FLASH gradient echo sequence: TR = 7.5 ms, TE = 2.9 ms, Flip angle = 10°, in-plane-resolution: 0.133 × 0.133 mm2, slice thickness: 1 mm; interslice gap = 0.5 mm. The heart rate and consequent R-R interval allowed for acquisition of 12 cine frames within each cardiac cycle with the given temporal resolution of 7.2 ms. Image analysis was performed using SEGMENThttp://segment.heiberg.se. For all studies, end-systole was referred to as the frame with minimal ventricular cavity volume. As can be seen from Table 1, in the WT control mice left ventricular (LV) and right ventricular (RV) ejection fractions (EF) were similar. However, in the VIP(-/-) mice the RV EF was significantly lower than the RV EF of the WT control group. Further, end-systolic volumes were approximately 50% larger in the VIP(-/-) mice compared to controls. Figure 1 demonstrates the enlarged end-systolic RV volume in a VP(-/-) deficient mouse. 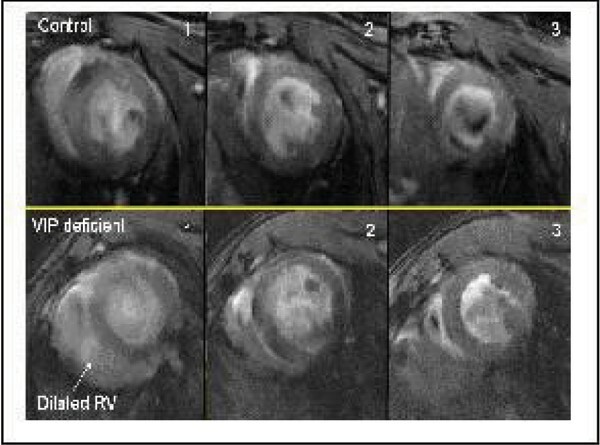 The figure displays two series of MR microscopy short axis cardiac images at the time of end-diastole from a WT control mouse (upper panel) and a VIP(-/-) mouse (lower panel) and there is clear visual evidence of a dilated RV in the VIP(-/-) mouse. We quantified ventricular volumes from Cardiac CINE MR images to phenotype the cardiac functional capacity in Vasoactive Intestinal Peptide deficient (VIP-/-) mice known to develop pulmonary artery hypertension. Pronounced RV dilation was observed in VIP-/- mice when compared to controls. In conclusion, our preliminary data demonstrate that VIP(-/-) mice have RV disease phenotypically expressed as increases in RV end-systolic volume and a reduced RV EF where as the LV is unaffected when compared to WT controls. Studies are underway to characterize the development of RV pathology in VIP-/- mice over time and to examine the effect of VIP therapy on the RV functional capacity in these mice.